We are an open-minded house that welcomes diversity in all its forms. We appreciate art, community living and local buying, but above all we love Mexico, its singularities, its history, its culture and we enjoy talking and discovering the city with fellow travelers. 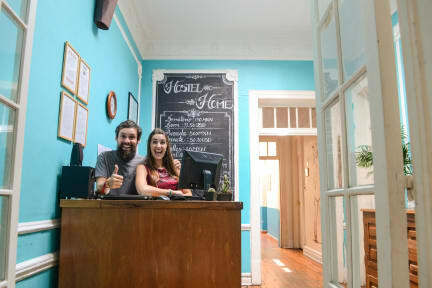 Hostel Home hosts interesting backpackers with usually amazing traveling plans. Together we work in making the house a space where we can share ideas, travel stories, music and food. Each dorm bed comes with a large locker to store valuables, you can use your own lock or buy one with us. Also each bed has access to their own power double power socket to charge electronics. It was my first hostel experience and I absolutely loved it! Whenever I come back to visit Mexico-City I’ll definitely stay here again! Everyone was so nice and welcoming, and I absolutely loved that quiet hours were at 11 p.m. Loved staying here! All of the staff and volunteers are super friendly, welcoming and helpful. As a solo traveler I enjoyed the vibe there and met lots of people to hang/explore the city. Also, the location is close to restaurants, street food, super market, and cool parks. Only room for improvement are the beds, could do with sturdier bunks that don’t move anytime someone climbs to the top or even just turns over. All in all I would def stay here again! Hostel Home was wonderful. This was my first time in a hostel in another country and I absolutely loved it. The common space is beautiful, met great people and the location is prime. Would absolutely come back! Don’t stay anywhere else in CDMX! 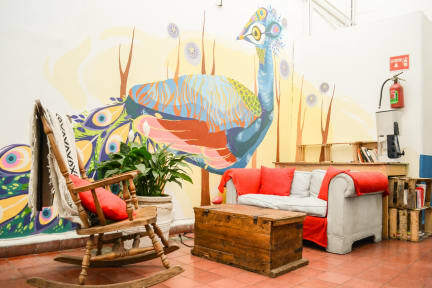 This hostel is almost too good to be true. The staff is super welcoming, the location is perfect—right in the heart of beautiful Roma Norte, and the rooms are clean and charming. The breakfast is exactly what you need to start your day of exploring and the coffee is the best free hostel coffee I’ve ever had. Hot water in the showers was never a problem and the bathrooms were always clean. Everyone I met here was lovely. Great all around! I really liked this hostel and loved the neighborhood as well. Unfortunately, I did lose a clothing item that was important to me because one of the staff members did not realize I had booked for two nights and not one. When I went out for the day, my bed was cleaned off and prepared for a new person and my things were placed in lost and found. A jacket of mine was no longer there when I went to recover my things. The staff on duty at the time helped me look for it but we were unable to find it. Loved staying at this hostel!! What amazing people I met there, everyone was game for doing trips and most were in the older solo traveller boat! The showers weren’t to bad and bananas and toast were provided every morning. The staff were also extremely helpful and friendly. My one gripe was with the beds, they weren’t too bad comfort wise but they were SO wobbly if the person above you moved or someone walked across the room it felt like an earthquake! I didn’t managed to sleep through once! Location is really good and central. Rooms are spacious and beds are comfortable. Also it really feels like home and the living room is absolutely stunning. Breakfast was included but poor, it could use an upgrade. I enjoyed my one-week stay there, there were friendly people, accommodating staff, lots of useful recommendations about what to do in this enormous city, and organized events every now and then. It was generally easy to find people for the different activities in the city. The only thing that was below my expectations is the breakfast that they provide. However, it gives you one more reason to go out and enjoy the incredible food scene in Mexico City. Not much of a vibe at all. A good place to get your head down peacefully but that’s about it. There are a few booklets with interesting things to see and do at reception but overall a bit boring. One of the volunteers/guests, who slept in the common room a lot of the time leaving it pretty much a no go area to talk, was really aggressive towards me when I used deodorant which kind of killed what little vibe there was there. Also there was a cockroach running around under my bed.